Swing bowling. A phenomenon as baffling to explain as it is to negotiate. The young Yorkshire seamer Ben Coad has already seized 22 wickets with it in three early season matches for his county. 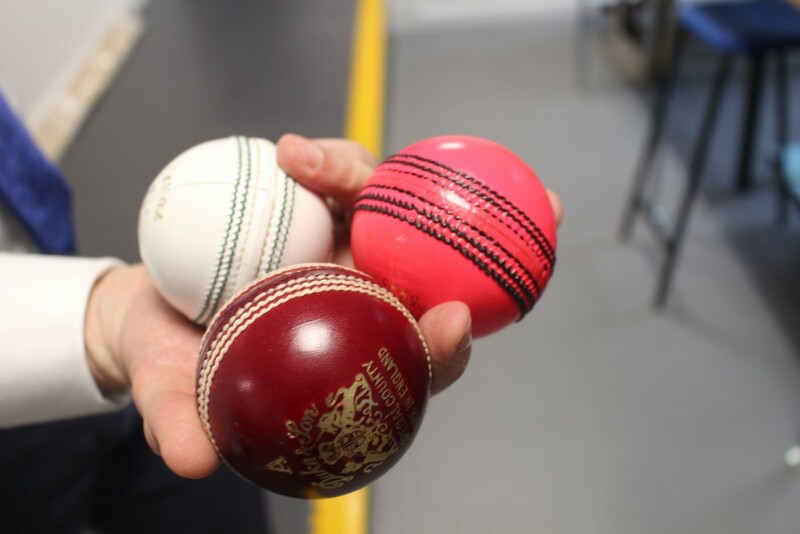 This summer, which for the first time sees balls of three different colours (and two makes) in use in county matches, the issue is more complicated than ever. Which balls swing the most, when, and most importantly, why ? After a day spent testing balls in a wind tunnel at Bath University I hope I have the answers. There are many myths and fallacies about swing. The wind tunnel immediately dispelled a principal one: that moist, humid air will encourage swing. It was bone dry inside the machine, yet some balls swung prodigiously. Humidity is largely irrelevant, but cloud cover is a big influence. Swing, as every bowler knows, is a very fragile art conditional on various factors. 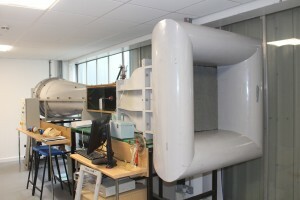 One is the stability of the air directly above the pitch (to a height of say 3 metres). The sun shining on the surface generates heat and convection currents rise disrupting that stability. That is why the ball swings considerably less on a sunny day. Cloud cover blocks the sun, preventing the ground from heating up, there is no convection and therefore the stable air is likely to be more conduicive to swing. Darkness can, of course, have the same effect. During Middesex’s champion county match against MCC in Abu Dhabi, batsmen became almost spooked in what became known as the ‘Twilight Hour’ as the pink ball suddenly dipped and swung around. Wickets fell at regular intervals. There is a whole round of day-night championship matches in late June as England prepare for the first-ever pink ball Test against the West Indies at Edgbaston in August. Expect a glut of wickets around sunset. 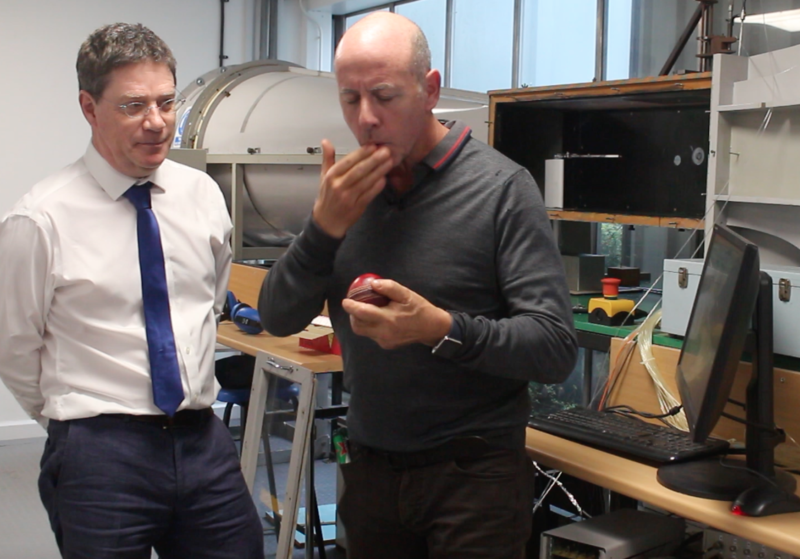 Professor Gary Lock, the head of mechanical enginnering at Bath, gives lectures on the aerodynamics of a cricket ball, and under his guidance we experimented with a variety of balls of different colours in varying states. 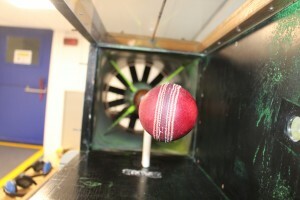 Each ball was inserted onto a thin metal arm in the wind tunnel which was connected to a number of sensors measuring the deviations of the ball as the wind was blown towards it (simulating a ball being bowled fast through the air.) The speed was regularly cranked up to 100mph. I sucked a mint and added sugary saliva to the shiny side of a Dukes ball about 40 overs old. After polishing it swung more consistently and at higher speeds. Bowlers have been doing this for years, of course, and will continue to do so. Murray mints are best. Note to South Africa’s Faf du Plessis – just don’t do it by transferring your finger straight from mint to ball. It was noticeable that the white (and pink) Kookaburra balls swung far less than the red Dukes. This is born out by the experience of most one day batsmen around the globe who flay the white ball about with alacrity, much to the chagrin of their red-ball counterparts who have to handle frequent and prodigious deviation. The reason for this is explained by Dilip Jajodia, the owner of Dukes since 1987. ‘Our Dukes balls are hand stitched in Pakistan,’ he says, ‘and the stitching is done forwards and backwards so that the seam is thicker and prouder compared to Kookaburra balls which are machine-stitched in one direction only. [The seam creates a rudder on the ball which controls swing.] Also we add grease to the leather for red English balls to make them more water-resistant so you can achieve a better polish than on an Australian-made Kookaburra which doesn’t have the grease added.’ Kookaburra balls are still used for all ICC tournaments (which is why every country plays with the white Kookaburra in their domestic competitions) but interestingly Australia have changed to the red Dukes for the Sheffield Shield (their first class competition.) Pink Dukes will be used for the day-night matches in England this summer. Now we come to the complex phenomenon of reverse swing. This happens when a ball becomes scuffed and cut on a dry, cracked pitch. In such conditions teams are good at (legally) allowing the rough side of the ball to become badly damaged while still looking after the shiny side. At some point, usually at about 40 overs, the ball held for a conventional outswinger (seam tilted to the left, shiny side on the right) starts curving the opposite way if it is bowled at high pace. 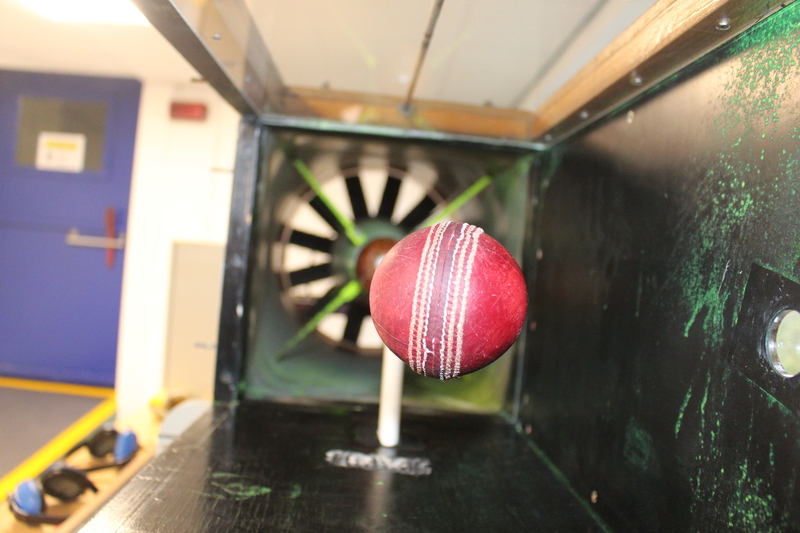 Professor Lock illustrated that this could happen even to a relatively new ball with a bit of appropriate doctoring (applying a few scrapes of sandpaper to one side) although again the pace has to be above 80mph. Players have experimented with sandpaper attached to the inside of their shirt cuffs for this purpose, though of course this is illegal. So to sum up, Dukes balls generally swing more because of the prouder seam and more-polishable leather, but the seam should be tilted to 15 degrees for best results (and maintained in that position as the ball flies towards the batsman – a wobbling seam will nullify swing.) Both types of ball will reverse swing with the right sort of abrasions and if bowled at high speed. An old ragged ball damaged on both sides that had been at the bottom of my bag for years moved not a jot in the wind tunnel even at 100mph. This was reassuring as I remember how consistently it had flown straight onto (and off) the middle of a succession of Somerset players’ bats. It is still really a batsman’s game. Hmm…not sure about the convection/lack of convection argument. Its effects would surely be minimal on a projectile with the mass and velocity of a cricket ball over such a short distance. More likely I think is that increased cloud cover – and therefore worse light – affects the batsman’s ability to pick up the flight of the ball early. Essentially it’s an optical illusion. Another observation: I’ve played some indoor cricket with those moulded, rubberised balls – a seam, but no shine/scuffing – and they swing pretty wildly (me bowling, not batting). This would indicate to me that the main determinant on whether or not a ball will swing is the condition of the seam and the way in which the bowler lets the ball go: “aiming” the seam and providing flight-stability by applying back-spin. Another optical illusion is provided by what the ball does off the pitch – the impression of a curving trajectory will be enhanced if the ball goes off the seam in the same direction. Thanks for the explanation about why cloud cover is important – it’s the still atmospheric conditions that help a stable airflow form around the ball, and of course that includes the effect of warm air rising from the pitch. It makes perfect sense and I hadn’t come across that before. One possible correction, though I’m not an expert: You write that “The ridge on the seam ‘trips’ the air coming towards it creating turbulence in a thin layer around the ball on the rougher side.” From reading RD Mehta’s article on the subject (‘Fluid Mechanics Of Cricket-Ball Swing’), the seam indeed “trips” the airflow and causes a micro-turbulent layer – but for conventional swing this is on the shiny side. One counter-intuitive thing about aerodynamics (and the reason why golf balls are dimpled rather than smooth) is that a microturbulent “boundary layer” actually gives lower drag than a smooth laminar flow. So this causes faster-moving air on the shiny side; Bernoulli’s law tells us that the faster the flow, the lower the sideways pressure, so for conventional swing the ball is pushed towards the shiny side, with the angled seam acting as a “spoiler” to create microturbulence. Reverse swing: As the ball gets older and the seam gets flatter, it needs the additional roughness of the other side to trip the airflow into microturbulence, and so the ball goes the other way around. It’s possible that the additional time needed for the airflow to form, without a proud seam as a ‘spoiler’, is the reason why reverse swing can happen alarmingly late for the poor chap with the bat…? A further line of enquiry related to the swing bowler’s art: does backspin help the ball to “kiss the turf” ? You’ll know better than I that backspin is vital for a stable seam position. (‘Conservation of angular momentum’ is the relevant law of physics – in layperson’s terms, the reason why a moving bicycle stays upright, but it you stop with your feet still in the toeclips, you’re in trouble). Given that topspin gives “dip”, the same laws of forces on a spinning ball (Magnus effect) should mean that backspin causes the opposite: the trajectory of the ball levels off as it approaches the ground, and give the seam more time to grab as the ball skids on. Mike Selvey once said in a conversation on The Guardian website, that he imagines the seam as a “buzzsaw” when this happens. What I don’t know is whether the revs of backspin on the ball from a swing bowler are sufficient to generate the upward force to cause this levelling off ? Maybe with your contacts….